020619 - Senator Elder Vogel, Jr. I am honored to have been chosen to serve on five Senate Committees in addition to my chairmanship of the Agriculture and Rural Affairs Committee for the 2019-20 Legislative Session. I will serve as the Vice Chairman of Environmental Resources & Energy Committee and as a member of the Appropriations, Banking & Insurance, Game & Fisheries, and Transportation committees. My committee assignments cover a wide range of issues that have a direct impact on the lives of the people of western Pennsylvania. The Environmental Resources & Energy Committee certainly has a major role in shaping the future of the Commonwealth and our region, particularly with the continued development of the Marcellus Shale industry. I am also pleased to continue to serve on the Appropriations Committee as it is this committee which works most closely with the state budget each year and reviews all bills that involve state spending. These committee assignments have energized me for the beginning of a session that holds many new and exciting opportunities. To stay up to date with the State Senate, please click here to get an overview of session topics. Tuesday we had the opportunity to hear the Governors proposed $34.1 billion General Fund budget for Fiscal Year 2019-20. Obviously, it was good to hear the Governor say he was not proposing any new taxes, however that raises the concern about how are you going to have the increase in the budget that he is proposing without raising taxes. There is some new funding for agriculture that is nice for animal diseases and the spotted lanternfly, which is now becoming a huge problem here in Pennsylvania. There is some more workforce development money for agriculture people to find people to work on their farms. We do have an ever-changing economy in Pennsylvania with our agricultural workforce. It is very disconcerting that he has cut about $30 million from our state parks. Our state parks and tourism are two of our biggest things depending on the day of the week. Our state parks are one of our gems in Pennsylvania. We will have to get to the bottom of that through the Appropriations process. I think workforce development and things like that are great to talk about, but we have to figure out how to pay for these programs. We will take it from here and go through the Appropriations process and we will see what happens. You can also receive guidelines and applications by clicking here. Beaver County Habitat for Humanity homeowners are people or families that might not be eligible for a traditional mortgage. Though our homeownership program, they have the opportunity to build and own their own home through an affordable 0% interest mortgage. Habitat is currently accepting applications for a new home on Connecticut Avenue in Rochester. For more information please contact Habitat for Humanity Beaver County by calling 724-846-1630 or click here for their webpage. A significant challenge faced by all governments is the responsibility to ensure that taxpayer funds are disbursed in an efficient and effective manner. In Pennsylvania, our Commonwealth has implemented a performance-based budgeting system. This system is a budget approach that identifies specific goals, objectives and strategies for executive agencies, and develops performance measures to assess progress towards those goals and objectives. 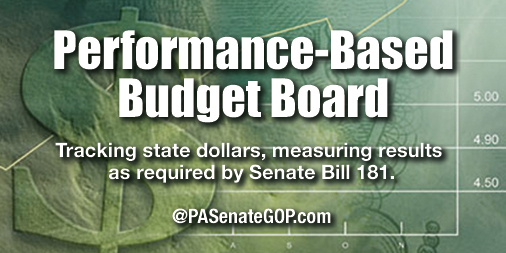 The Performance-Based Budgeting process – measuring state spending against expected results – is underway in PA with the PBB Board approving reports to grade the Banking and Security Department and General Services Department, as well as criminal justice agencies and tax credit programs. Performance-Based Budgeting was implemented as a result of Senate Bill 181, enacted in 2017. For more information on the PBB board or upcoming objectives, please click here. Under the new Keystone Scholars Program, $100 will be deposited in an education savings account for any PA baby born/adopted in 2019. It was created by the General Assembly last year to boost college savings and is funded by private donors. If a family puts in just $25 per month starting when their child is born, by age 18 that would grow to approximately $10,000, based on PA Treasury investment assumptions. As part of a demonstration project, babies born in 2018 in six counties may also be eligible, but must claim their Keystone Scholars grant by the child’s first birthday. A baby with education savings at birth is more likely to pursue and complete some form of education after high school. Parents can sign up by clicking here. The Safe2SayPA school violence prevention program created by the General Assembly is up and running. It helps youth and adults recognize signals from individuals who may be a threat to themselves or others and anonymously report the threat to a crisis center, which reviews all submissions. For more information and a downloadable app, please click here. 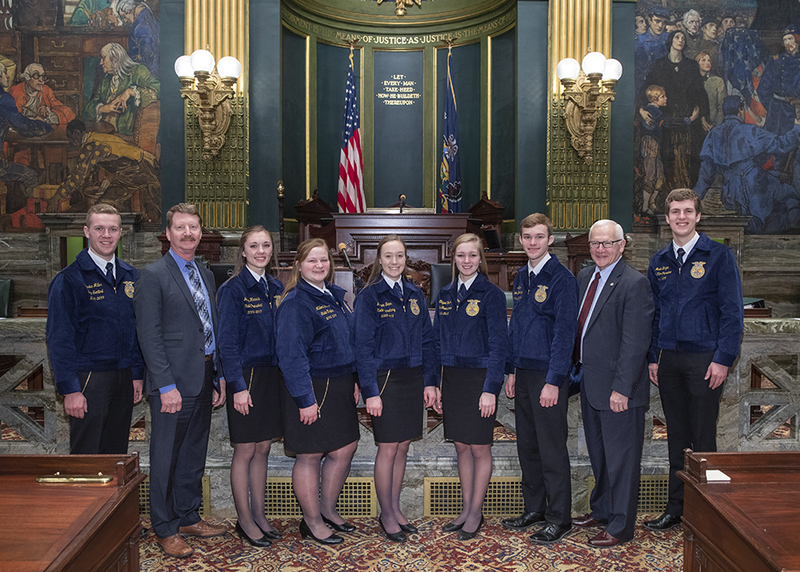 I was honored to get the opportunity to present my resolution making February 16th-23rd FFA week in Pennsylvania. It is important to recognize those young individuals excelling in the agriculture community. To watch my resolution presentation, please click here. Applications are being accepted for Merit Shop Construction Scholarships from the Keystone Chapter of Associated Builders to assist individuals seeking to further their education in careers in construction. An average of eight scholarships of up to $4,000 each is awarded yearly. To be eligible, applicants must enroll in a trade school, college or university program that is directly related to a construction career, including skilled trades, engineering, or construction management. Applications are then reviewed by distinguished industry professionals serving on the Scholarship Selection Committee of the Merit Shop Training & Research Center, Inc. Deadline to apply is February 22. For more information and criteria on the scholarship, please click here. Businesses, nonprofits, schools and local governments can apply now for emissions-reduction state grants to replace, re-power, or retrofit fleet diesel-powered trucks, buses, and other vehicles and equipment. The Pennsylvania State Clean Diesel Grant Program is a competitive grant program for a wide variety of diesel emission reduction projects. This program is primarily funded through an allocation from the Diesel Emission Reduction Act (DERA) disbursed by the U.S. Environmental Protection Agency. Approximately $9 million is being allocated to be used as match funding for the program, making Pennsylvania eligible for additional federal DERA funds. Deadline is February 28, 2019. Applications and guidance can be found by clicking here. PennDOT winter operations use more than 2,248 trucks, plows, and salt spreaders across nearly 95,000 snow-lane miles. To use, click the “Plow Trucks” box above the state map after clicking here. The Pennsylvania Department of Transportation is seeking hardworking college students for employment from early April through October for the 2019 Summer Maintenance Program. Work includes seasonal maintenance work, crash system input and analysis, and maintenance and custodial services at roadside rest facilities. Many students also perform laboring and flagging duties in maintenance organizations and at highway worksites. Pay is $13.56 an hour and deadline to apply is Feb. 15. For information on this opportunity, please click here.